Gold Industry Group Vice Chairperson and Gold Fields Vice President of Legal and Compliance Kelly Carter took to the podium for the second year in a row as adjudicator on the controversial debate asking: are corporate diversity targets promoting mediocrity, rather than driving performance? Since the 1970’s, women have broken into the mining industry – first as geologists, later through investing and promoting gold mines, and today in a broad range of operational and high-ranking roles. Yet, despite the number of female graduates entering the industry, corporations are still concerned with the imbalance of gender, some going so far as to hire for gender over actual skill set. Gender equality in the workplace is not a new topic, however progress is slow across the mining industry and organisations are being challenged to focus on real change. 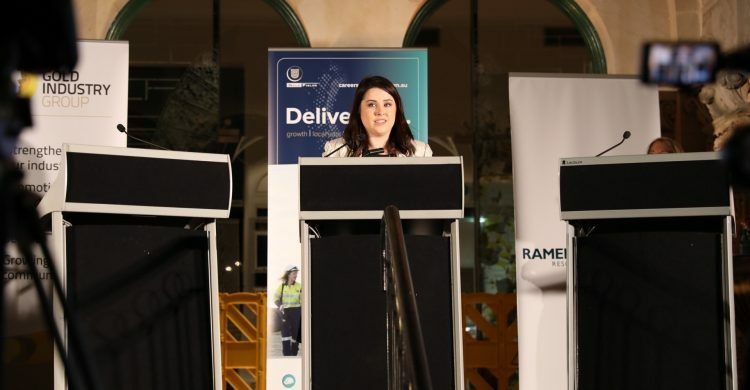 Led by Madam Chair Ms Carter, this year’s debate team included one of the WA Mining Club’s own – our Chair of the Young Professionals Steering Committee and Gold Road’s People Culture Business Partner, the talented Samantha Ware. Samantha was joined by Ausdrill Non-Executive Director Alex Atkins, Newmont Australia Group Executive of Legal Services Andrew Kennedy and former National Party politician Brendon Grylls. WA Mining Club Young Professionals Chair Samantha Ware & Vice Chair Breanna Cameron at the event. Gold industry advocate and country man Brendon Grylls kicked off the conversation by grabbing the audience’s attention with his comical approach. “Do you really think companies would be successful if all the women who actually do the work were promoted to senior positions, leaving all the men who were in senior positions to actually get stuff done?” said Mr Grylls. “Now that’s a recipe for instant company shutdown,” he chanted. The subtle underpin to his more entertaining points was a reasonable approach – quit discussing gender targets and start doing something about it. Experienced industry professional Alex Atkins tackled the renewed efforts by mining companies to ‘meet gender quotas’ as damage control for their social license to operate. “Research shows that companies which really value diversity are known to benefit materially from optimal decision-making, higher productivity, improved safety, better managed risk, greater stakeholder engagement and innovativeness,” said Ms Atkins. While this sounded perfectly logical, Ms Atkins made a point of shining a spotlight on the ‘elephant in the room’ – the retention of female employees. “Such a pronouncement is only words until it is achieved and sustained. We will only remain the best if we use all the available, diverse talent we have on hand,” she continued. Qualified legal counsel Andrew Kennedy agreed with Ms Atkins that retention is key in a male-dominated ‘boys club’. “Even if you can recruit women, unless you’ve changed the culture you are not going to keep them,” he said. Mr Kennedy put forth the simple fact that gender diversity is good for business – as it encourages an open-minded approach to recruitment, improves performance and ensures a higher level of employee engagement. “Targets are a key tool available to help the business focus on changing that culture. It’s not just a matter of reducing the legal risks and saving money – you’ll get a more inclusive culture, a better place to work, and a high performing and more profitable business,” he continued. 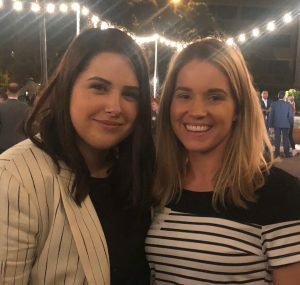 Speaking from personal experience, workplace culture advocate and WA Mining Club Young Professionals chair Samantha Ware urged everybody to stop skirting around the topic and start putting solutions into practice. “You can recruit all the females you want to achieve your quotas, but to truly be diverse, you actually need to retain them,” said Mrs Ware. “Our female diversity is at 35% across the business and rising! In our scientific/technical roles we have over 40% females. “We implemented flexible working arrangements, pay equity, upskilled our leaders and changed our rosters to work less while maintaining their pay. The result of our initiatives – a holistic workplace, one that is happy, inclusive and productive. “I challenge you to take tonight’s solutions back to your employer and lead change. We will achieve gender equity in mining, and we can do it before the next generation of women have to experience the toxic culture,” Mrs Ware concluded. Ultimately, the 300-plus crowd voted with the proposition that gender equity targets on their own would not affect change and the right culture and equal work arrangements must be a strong focus. Due to the success of the annual event, Gold Industry Group Chairman and The Perth Mint Chief Executive Officer Richard Hayes announced the event would form part of a national Women in Gold tour in 2019.